Do you long to teach English abroad but worry that you won’t find work because you’re a non native English teacher? Well, don’t despair. 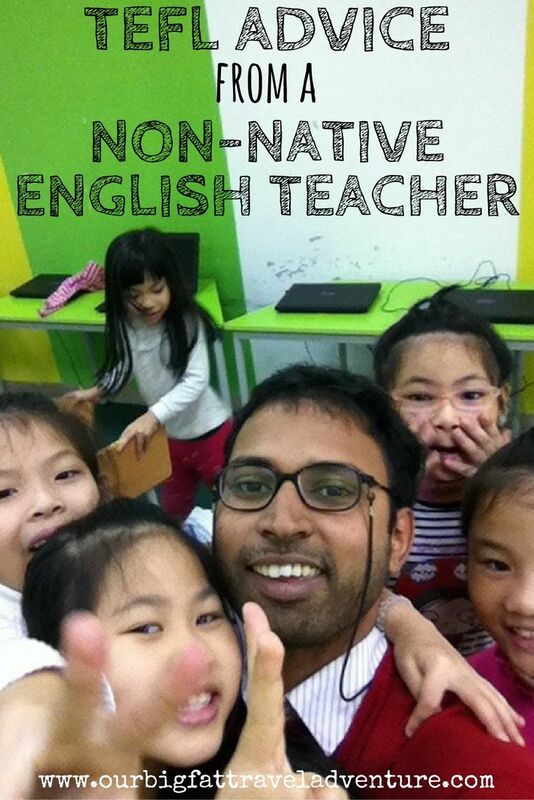 I get a lot of messages from aspiring teachers who aren’t native English speakers and here’s the good news: there are non native English teacher jobs to be found in Asia. 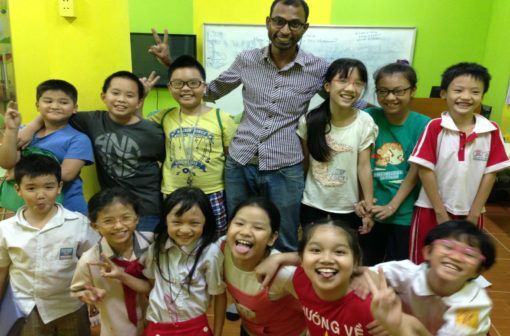 In this post, Venkat Ganesh from India shares his story about teaching in Vietnam and gives some excellent advice about how to find TEFL jobs for non native speakers. 2018 teaching opportunities in Hanoi – the language centre we used to work for in Hanoi is now recruiting teachers for 2018/19. If you’re a native English speaker with a degree and TEFL qualification, contact us now and we can put you in touch with the director for an interview. 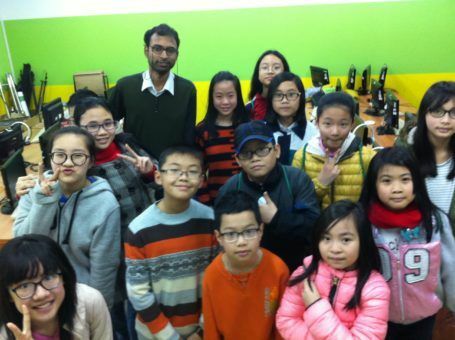 According to the International TEFL Academy, eighty percent of people teaching English abroad are non-native speakers so there are plenty of opportunities available, as Venkat discovered when he set out to find a TEFL job in Asia. My name is Venkat Ganesh but you can call me Venky. I’m 33 and not born, but raised entirely in Bombay, India, until I moved to Vietnam in July 2014. Now I’m back in Bombay again. You can find out more about Venky and follow his adventures by heading over to his blog, India Backpack Motorbike. What made you decide to become a TEFL teacher? I come from a family of teachers and I was always attracted to the teaching profession. 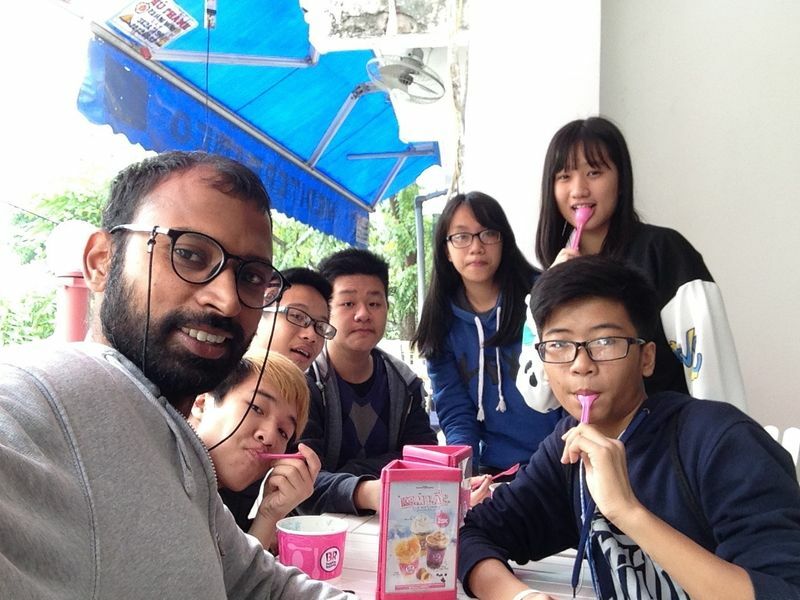 Although I achieved a post-grad degree in management studies and then worked in managerial positions for about seven years, there was always this thing I told myself: “Someday I’ll be in the teaching profession, at least for a little while.” So when I quit my job to travel around, I learnt that TEFL is a great way to combine both of my longstanding dreams of teaching and travelling. And thus I became a TEFL-er. What teaching qualifications and experience did you have before you started looking for work? I never had any teaching experience as such. But I did do a CELTA course and then moved to Delhi because I heard there were some freelance teaching gigs there. But after moving there I realised most of these assignments were more of the corporate training, soft-skill training sort. It was similar in other cities in India as well, while some of the big organisations like the British Council or Inlingua always wanted someone with experience. So I said goodbye and decide to try my luck abroad. Which countries did you consider teaching in? I considered Thailand, Vietnam and China to start with because from my research I found out these were the places where there might be a really small chance of finding work as a non-native speaker of English. South Korea and Taiwan were completely out of question because I found out that without a passport from those specific eight or so countries, you don’t get a visa. 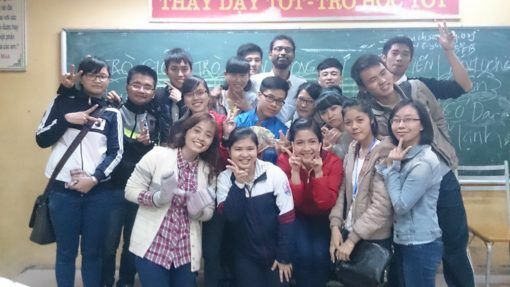 How and why did you choose to teach in Vietnam? Well, my search started with Thailand in March 2014. I had a few offers there but if I liked the city where I was offered a job the pay was too low, if the pay was good then the school seemed dodgy, if both were good I found the city not to my liking. So after spending a couple of months there I left and went back to India before deciding to check out Vietnam. Well, there was no particular reason for choosing Vietnam, but somehow as soon as I landed I found Vietnam to be more appealing than Thailand. Honestly, there weren’t any specific reasons. Like a lot of TEFL-ers, I went, I liked it and I stayed. How difficult was it to find a job as a non native English teacher? It wasn’t easy but not impossible. The first challenge is skin color. It’s easier for a white-skinned person to get a job without qualifications or skills than someone who was born and raised in Australia but his parents were Vietnamese. I wouldn’t call it a hate-filled racist attitude but it’s more a notion among a good number of Vietnamese people that people from native English speaking countries are only white. While on the contrary, those seven countries (US, Canada, UK, Republic of Ireland, South Africa, Australia, New Zealand) are some of the most multicultural countries in the world. Similarly, a lot of African countries have English as an official language, just like India. Even the Philippines has a huge English speaking population. I think the schools, language centers and parents in Vietnam need to realise that they should look for someone who has good teaching skills rather than someone who ‘looks right’. How did you overcome those challenges and find a job? You have to be persistent, nothing else. I started my search down south in Saigon and made my way up to Hanoi over a period of a couple of months. I spent a good two weeks in every city. I would map out all the language schools and agencies, go and drop off my resume and then follow up. There will always be someone who’ll call back, or if you’re lucky, offer something. Then the ball is in your court. If you like what is offered, take it. If not move to the next place and continue. Can you give other non-native speaking TEFL teachers some advice about finding a job? 1 – Be clear why you want to teach. If you think that it’ll be an easy way to travel and live in some exotic place, please don’t. There are a lot of other ways to fulfil your sense of adventure and wanderlust. As philosophical and clichéd as it may sound, teaching is a very influential profession and what you do as a teacher will really impact your students and their lives. 2 – Get yourself to Vietnam. A lot of people (mostly from India) have written to ask me to share resources/contacts to find jobs. The thing about Vietnam is that you have to be in the country to find that job. If you think you’ll email from the comfort of your home and someone will offer you a position, let me tell you that most of times nobody will even look at your email. 3 – As a non-native teacher it’ll take longer to find work so be persistent but also have your finances sorted. It’ll all depend on your lifestyle, but have about $4,000 saved to give yourself three months in the country to find a job that you like and then scale it up to a consistent level of work every month. Even if you get a job in your first month, you’ll need money for rent and deposit, food and buying yourself a motorbike. Who did you work for in Hanoi? Most of my work was with FPT University. I started at their language center teaching young learners but a year later when the language center was shutting down, I found out about an opening at FPT School which was a sister company. At FPT School, I taught high school students from elementary to upper-intermediate levels. I also taught at the University of Transport & Communication’s English club and trained the staff and lecturers at University of Social Sciences during my early days in Hanoi. How many hours a week did you teach and did you work daytime or evening hours, or both? The number of hours varied a lot. For example, in February when it’s the Vietnamese New Year and then in March which is the month before yearly school exams, I struggled to get 20 hours a month. However, during the summer when there are special summer classes I got 20-25 hours a week. Overall, I would put it at about 15-18 hours a week. During the summers it would be morning as well as evenings, but otherwise mostly evenings and weekends at the language center. At the high school, during the first term it was three days a week and then I had the rest of the time off. But this changed during my second term there when it was only mornings. Because I didn’t have any fixed hours and also because of all the issues I mentioned above, this varied a lot, but I got paid a better hourly rate than a lot of people who worked at bigger language centers did. I was paid $25 an hour after tax. The bigger centers usually pay about $17-19 an hour. As far as I know (or at least among all my teaching friends), in Vietnam nobody had ever seen an actual work permit. Their employers somehow managed to get it extended for a year or supported by providing the right documents. I did not have any such support from my employers and had to do things by myself. Whenever extension was possible without leaving the country I would go for it or if I had to go for a visa run, flights to Bangkok were cheap. The thing that annoyed me the most was how frequently the visa rules changed and how nobody had any clue what was going to happen. My teaching experiences were incredible. When I was looking for teaching opportunities I wasn’t keen on teaching younger students because I didn’t like kids as much and thought I would do better with adults and university students. But I took the work at a center teaching young learners just to keep myself going until the right break came along. It was challenging at first but I never realised when I made the shift from referring to them as ‘my students’ to ‘my kids’. Teaching high school students was as daunting as dealing with hormonal teenagers could be but I loved that I could crack a joke and they would understand. I loved it that I could play my favourite Beatles songs to give them as listening practice (and also influence their musical tastes) or have a chat with some of the ‘cooler’ kids about whether Tupac is really dead. What area did you live in and how much did your apartment cost? I found a house share by responding to an ad on the Hanoi Massive Facebook group. I lived in Ba Dinh district, very close to Ho Chi Minh’s Mausoleum and a two-minute walk from the B-52 bomber lake. It was a typical Vietnamese house in a typical Vietnamese neighbourhood. I shared it with four other wonderful housemates and a turtle. The rent and utilities came to about $200 a month. I spent money on rent, utilities, food, gas and repairs (if any) for my motorbike and a bit of going out. I would rarely go out drinking or partying but I did spend a lot of time at the quirky cafes Vietnam is so famous for. The monthly costs would depend on lifestyle of the person, but for me about $500-600 was enough to take care of everything. What ate into my savings were the visa runs and the lack of consistent income. I would have two good months with lots of work and then the amount of work dropped for a month and it would coincide with my visa run/extension. This changed after I moved to teaching at the high school I mentioned earlier. The good thing about high school (or any public school for that matter) is that your hours are consistent, unlike language centers where there might be a break between completion of a course and beginning of the next one. I left Hanoi with $4,000 after booking my flights back home. I saved that during my last six months there and I could have saved a bit more had I not travelled to Myanmar for a month. What were the best and worst things about teaching and living in Vietnam? Since I was a part-time teacher, the worst thing was the lack of stable work. Just when I would think of finding extra work outside of the center I was loyal to, my workload would increase too much for me fit other centers into my schedule. And just when I thought my workload was about right, it would suddenly drop. That and lack of support for visa purposes from my center. Of course there were a lot of teachers who would freelance and manage their own visas but an Indian passport is not the strongest and that hindered my ability to save more money. As for living in Vietnam, I found the food to be disappointing. Coming from India the lack of variety in options as well as tastes was always a bummer for me. But I had fantastic housemates and we would cook together regularly. I loved spending time at coffee shops watching people, going for bike rides to the outskirts of Hanoi with my housemates, learning Vietnamese, my ukulele club weekly meetings. Most of all I miss my kids. They were an enthusiastic, and ‘willing to learn’ bunch even if they were naughty at times. So, can a non native speaker teach English in Asia? I think Venky’s story shows that with a bit of determination and persistence, it’s definitely possible. In particular, from Venky’s experience it appears that there are a variety of teaching jobs in Thailand, as well as in Vietnam, for non native speakers especially if you can go to the country and apply in person. 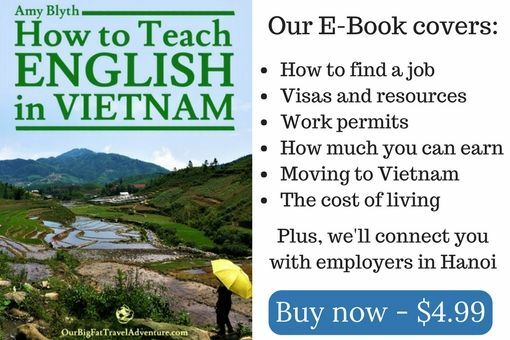 This is a very in-depth look at teaching English in Viet Nam. We lived there for a total of five months, two different times and I knew many that taught English and loved doing so. From what I understand is yes, key to be in country and key to be persistent. Would love to use it on my new website I’m launching shortly. Thanks for sharing this! I’ve recently decided to pursue a TEFL career and finding info for a non-English native speakers have been scarce to find. This post has given me the motivation in my decision. Hi Nor, thanks for reading and commenting, I’m glad you found the post useful. Best of luck with the job search and your TEFL career.